I had my first dye failure a short while back when using Sheep Sorrel. I decided to use the Black Walnuts I had been saving and over dye the yarn. I started with a 5 gallon pail of walnuts some with hulls and some without. Covered with water, put on lid, and let sit. Took off lid-it was kind of gross! Yep, I stuck my yarn in there after I strained the walnut mixture. After 90 minutes with heat, I turned it off and let it sit overnight. I had to do several rinses until the water ran clear. I am really happy with the end result! I will definitely be dyeing with Walnut again! Lucky me, you get to use it, more than once. Turned out really nice, and no chemicals necessary :) will it fade with washings? It is suppose to be colorfast, but I am new to this dyeing thing, so we shall see! I've used black walnuts but simply soaked them in water for a long time, to get a lighter brown color. I love the deep color you got. That is an elegant color...what about combining it with highlights of the pokeberry in some sort of knit wear:? That would be pretty :) But this has been earmarked for a hat for my husband. That is such a lovely color of brown - so rich looking! Your yarn is encouraging me to learn how to knit and/or crochet! Have you ever dyed wool with beets or blueberries? I know these stain my hands, do they work on wool? I have read about using beets, but I can't remember what color you end up with. I have not found anything about using blueberries. A lot of colors don't take and if they do, it is a different color than what you expect. Turned out really nice! I would have had a hard time putting that wool into the pot of muck. You were brave and it paid off! I love this idea! We are buried under mountains of black walnuts and no one in my family likes them. It seems such a shame to let them go to waste, though. I'll definitely pin this so I don't forget about it. That color turned out beautiful! 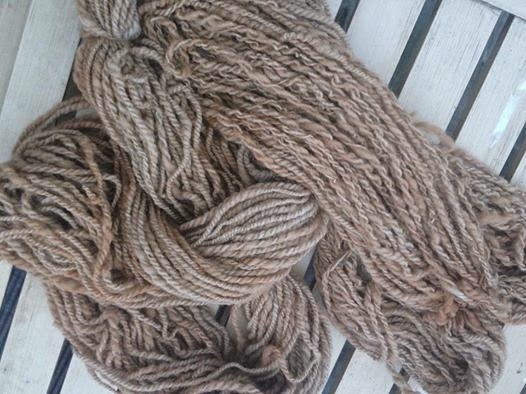 What a neat idea to dye naturally (and we also have black walnuts on our property!)... Thanks for sharing! We have added 25 merino sheep to our fold so this will come in handy soon!! Thanks for joining us on the Art of Home-Making Mondays this week! It was nice to see you there :) Hope to see you next Monday! I am learning so much about dyeing from you! Thanks so much!! This is such an interesting process to read about! I love how the walnut color came out even if it was a messy process for you. It sounds so time consuming, but worth it! It really isn't too bad, most of the time is waiting and watching. Love the color, I've also heard of using black walnut to stain basket reed! I have thought of trying some fabric as well as the wool. I think black walnut would be a great dye for a basket! !